Some people at the Latter-day Saint Church-affiliated Polynesian Cultural Center only know her as Sheena, a part-time Maori musician, but to 600-plus students as well as the 52 faculty members she oversees every week-day, she’s Mrs. Alaiasa [pictured at right], Principal of Samuel Wilder King Intermediate School in Kaneohe, Oahu. In fact, she’s so good at her full-time position that the Hawaii Association of Secondary School Administrators recently named her State Middle School Principal of the Year, based on her excellence in professional growth, collaborative leadership, advancements in curriculum, instruction and assessment, and personalization of learning. 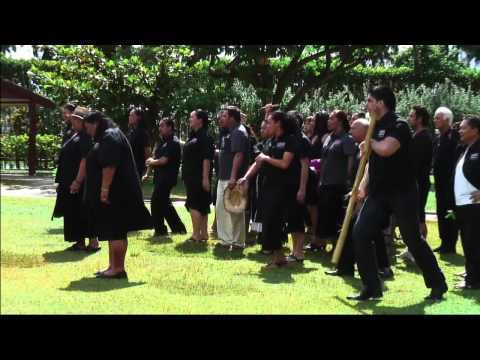 With that honor, she went on to become the first person from Hawaii to be nominated as a national middle school principal of the year finalist; and subsequently won the title in Washington, D.C.
Before sunrise on November 30, in accordance with New Zealand Maori custom, carvers, service missionaries, island representatives, other Maori from the community and special guests waited at the Maori Village gate for a special kawanga ceremony to mark the reopening of the PCC’s Maori Village following an extensive renovation and replacing many of the original carvings. More than 150 people participated in the ceremony that included Seamus Fitzgerald, PCC Director of Cultural Islands and Maori Village manager, and his team inviting the guests onto the marae with chants, followed by the entire group slowly inspecting the newly renovated features and carvings in a procession.